You might think the middle of the world would be deep within the earth’s core (that is, assuming you believe the world is round). Well, you’d be wrong. 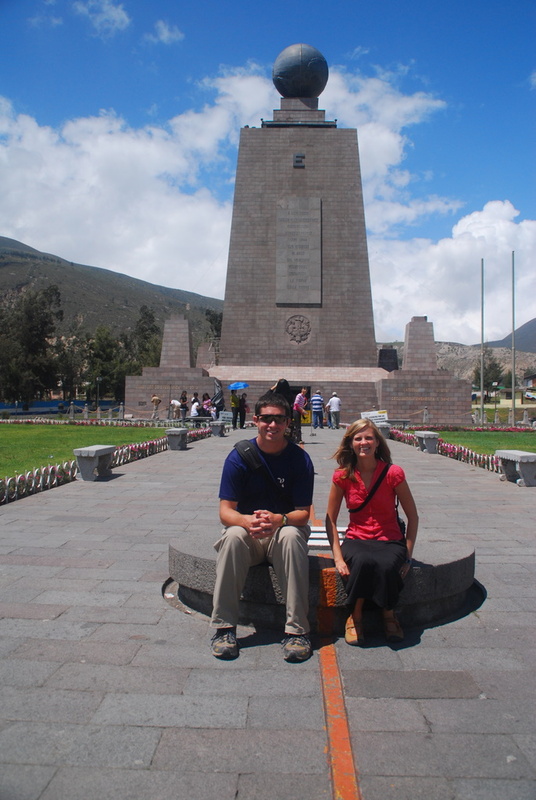 Turns out, the middle of the world (Mitad del Mundo, as it’s known here) is just outside of Quito, Ecuador. And my is it a delightful place. You might begin with the Colonial Quito scale model, and follow it up with the model versions of Ecuador’s two other largest cities, Guayaquil and Cuenca. Or perhaps you prefer a history of French expeditions to determine the equitorial line. Or maybe bugs are more your thing, there’s a great insectarium with all sorts of gross creepy crawlies (seriously, they’re so big here!). You can hold your favorite and have your photo taken for only $2! Seriously, I can only feel for the guy that had to capture these bugs, then stick a pin through their exoskeletons so they could be pinned up on the wall. But don’t worry, there’s more. There’s a planetarium that unfortunately costs extra so we didn’t go. But the highlight is the 30 meter tall tower museum of indigenous cultures (also extra, so we also didn’t go in) that stands right on the red line indicating the equator. Just into the northern hemisphere are a wide variety of souvenir shops, while just into the southern hemisphere you’ll find restaurants with touts galore! There’s even a bull fighting ring. And here’s the kicker of the whole thing … it isn’t even the real equitorial line. The French were about 150 meters off (though, in defense of the French, this is still quite accurate given the measurement was made in 1736, well before GPS’s exposed their error). The real equitorial line runs through the Inti-Nan museum next door, an even more delightful place. The Inti-Nan tour starts with a guinea pig coop followed by the guinea pig roaster. Moving on, we witness the immense size of Ecuadorian tarantulas and anacondas. Not for the faint of heart. 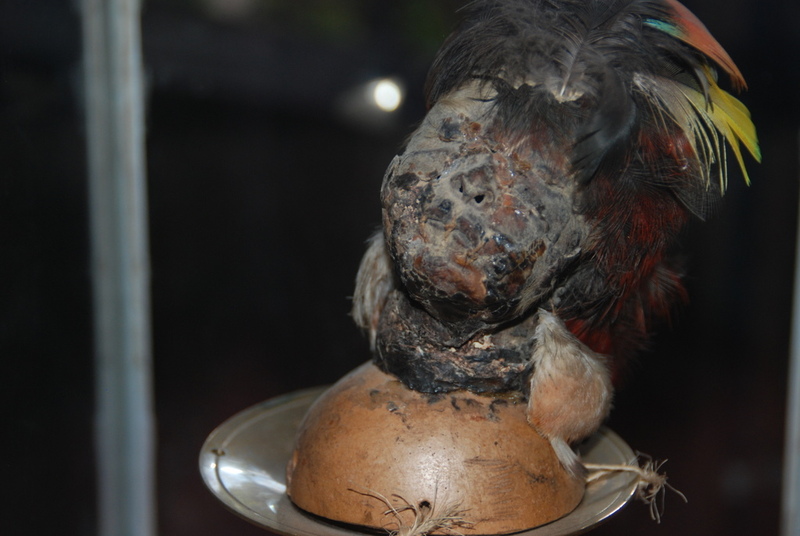 The highlight are the authentic shrunken human heads on display, complete with a short recipe for how to do it (we may share after we’ve tried it!). This is followed by poison dart shooting practice and life size models of naked indigenous people. Brilliant, eh? But what was actually really cool (as if we hadn’t had enough coolness for the day) was the demonstrations of various things that happen on the exact Equator. Toilets really do flush clockwise south of the equator and counter-clockwise north of the equator. We proved it. And on the equator, water just rushes straight down, no spinning involved. 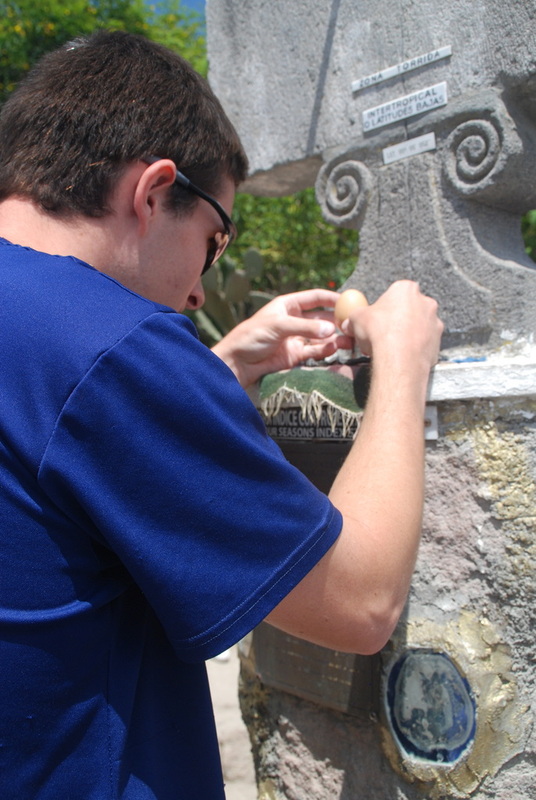 You can balance an egg on the head of a nail (although apparently I defy laws of physics because I still couldn’t). You also weigh less and can jump higher on the equator because of the bulge of the earth (hence you’re farther from the core and gravity is weaker) and you’re not as strong. While standing two feet from the equator I could keep Theresa from opening my hand, right on the equator she had no trouble pulling apart my fingers. It all has to do with the fact that the only force pulling on you at the equator is straight down, there are no sideways forces. It’s really a pretty magical feeling. I think I’ve covered it.